Despite what some people may assume, there is a lot of good food to be had in Berlin. Sadly, if you're a vegetarian, traditional German cuisine doesn't have a lot to offer. True there is Flammkuchen – a kind of pizza without the tomato sauce – and Käsespätzle can be nice on a cold day, but if you're looking for variety you need to seek out the increasing number of good restaurants serving ethnic food. Although Berlin can't really compete with London on that score, I always make an effort to visit the type of restaurants that are a bit of a schlep for me to reach in the Big Smoke. 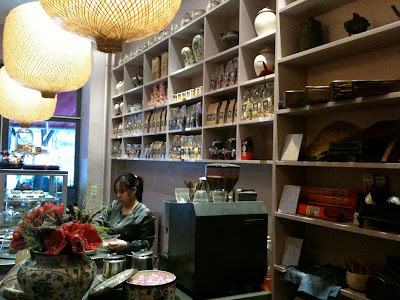 A couple of my favourites are two Vietnamese places, Si An & Chi Sing, run by the same people. So when I read about a new dessert spot they had opened, Si An Tra, I was determined to visit. But by the time I returned to Berlin on this trip I had completely forgotten all about it until I saw it mentioned in a blog I follow. I was suddenly reminded just how much I wanted to visit this place. What would Vietnamese cakes be like? How would the tea be served? What would the décor be like? There was only one way to find out. As I made my way through Prenzlauer Berg last Sunday I became increasingly worried. It was after three o'clock and all of the cafes I passed were already full of Berliners and tourists enjoying the ritual of weekend Kaffee und Kuchen. I started to worry that I might be out of luck but on arriving I was hit with a familiar double whammy of emotions: firstly joy that there was only one of the four tables taken and therefore I could get in; then sadness that at this peak time the cafe didn't seem to be doing too well. The cafe is small but really lovely. Like the restaurants, real care and attention has been paid to the décor. 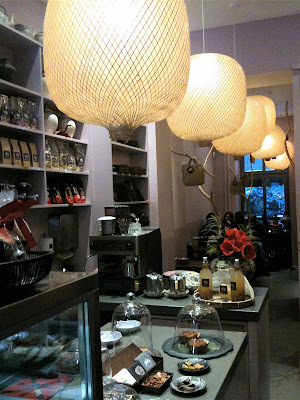 Paper lanterns hang from the ceiling and the tables seem to be supported by branches stripped of their bark. The waitress marked herself out as different to the usual Berlin waiting staff by being incredibly smiley and helpful in describing the teas and cakes on offer. Although I had been excited about visiting, I have to admit that my hopes about the quality of the cakes were pretty low. 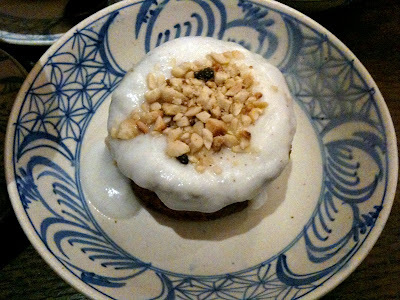 In my experience, Asian desserts are not usually anything to write home about – certainly to my western palate anyway. But Si An Tra showed me that that doesn't have to be the case. The cakes were simply fantastic. Coffee Boy and I shared a Ban Chuoi Dua which was a dense coconut sponge topped with a coconut sauce and nuts, and a Ban Chuoi Dau Phung which he described as “hmmmnnn, banana Reeses Peanut Butter Cup!”. That was grossly unfair as, in my opinion, the aforementioned confectionary is not necessarily to be held up as the essence of good taste. 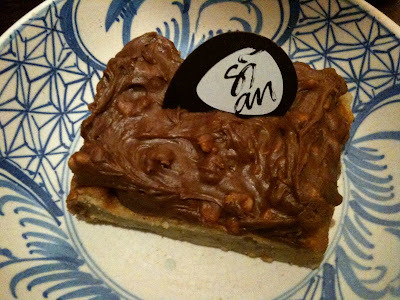 This cake was lovely: it had a kind of banana bread base and a delicious peanut and chocolate topping. But as if that wasn't enough, the tea was gorgeous too. 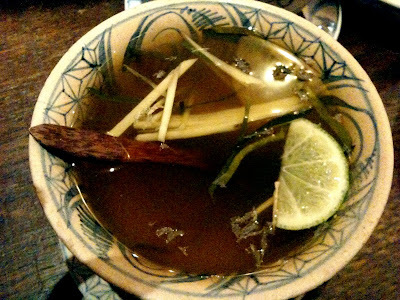 I had a Jasmine tea which came served in a fairly large bowl and was full of goodies: ginger; lime; lemongrass; longan; lotus seeds and honey. Coffee Boy eschewed his usual latte and chose a Sencha green tea which had just a hint of ginger and lemongrass. The whole experience was really very lovely: delightful surroundings with a selection of teapots, teas, crockery and bags to look at; a really nice waitress; and fantastic goods to savour. I can highly recommend it. When we left there was no one else left in the place, which this time left me feeling nothing but sad. It would be a crying shame if they didn't make a success of this great tea room. I hope that next time I return they are doing a healthy trade, but still with one table free for me. That would be just perfect. Nice to read your account and see that you had such an excellent time. Sorry I missed you but it sounds like you will return, so hopefully I can join you then! I definitely plan to go back. And next time I'm determined we conquer technology and meet up. Looking forward to it! Just heard on the food programme today that tea sales in Britain are rising again AND more importantly that there is a growing interest in good quality tea. If you haven't heard it, it's worth a listen as all about tea - http://www.bbc.co.uk/iplayer/episode/b00pn410/Food_Programme_Speciality_Tea/ Even Cornwall is growing its own tea now. Brilliant news Choclette. I think tea has been woefully neglected in recent years - thanks to Starbucks and the subsequent coffee revolution. I like coffee as much as the next person but I think the variety & thirst-quenching qualities of tea are hard to beat. Thanks for that link - I'll definitely have a listen later.